let's face it, we don't have the option of wearing a brand spankin new outfit every time we go out. but who cares? it's fun to remix your clothes. i played around creating three different outfits based on one shirt that i've been coveting. 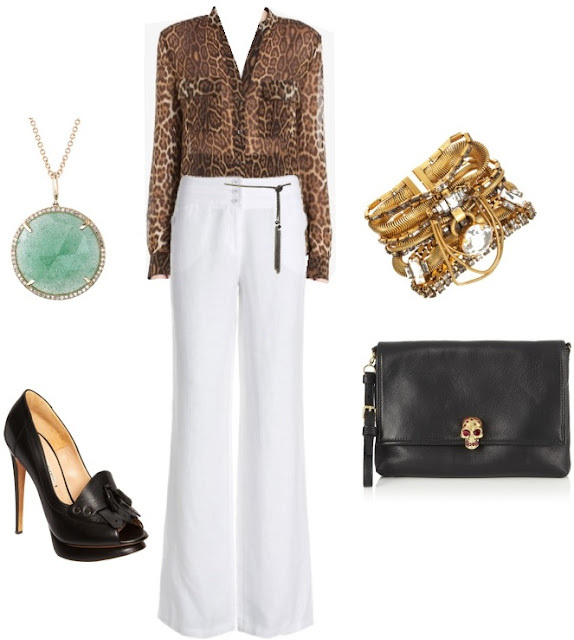 yep, you can add a sheer leopard (or cheetah, who cares) shirt to my list of "must haves". and because i can never seem to make up my mind, my mind is reeling with a bunch of different ways to style the hair on these. p.s. does anyone else worry about their hair more than their outfit? or is it just me and my uncontrollable curls? i think my favorite might be "edgy"...which is so weird because that's not my normal style at all! LOVE the stacked rings in look 1! Great combinations! I wish you were here to help me reorganize and restock my closet! GREAT SET .LOVE ALL THREE OF THEM .SKIRT IS AWESOME. VISIT MY BLOG AND FOLLOW ME. !! I am in love with these looks! You need to post where I can get some of these babies:) Happy long weekend! My hair is a constant source of stress...I have curly hair as well and it's frizzy and a giant mess 99% of the time. I get Japanese straightening which helps enormously but really, I am often at the whim of the weather! I think I love the second ensemble the most!!! The combos are just beautiful! I think I'd be the Edgy one most often but love the shirt with the skirt and the white pants too! i'm out of town and will be mixing my clothes with a new eye thanks to you! As for your hair, I know what you mean. As a curly hair gal, it seems like if my hair looks bad nothing else matters! I've given in to the low chignon/bun when I just can't be bothered. They say if you wear a smile you'll always look good! love all three looks, but i think edgy is my fave!